Preferred Lies on fairways only from Friday 31st March 2017. Latest News : Preferred Lies on fairways only from Friday 31st March 2017. ‘Preferred lies’ is the term that means that you as a golf player are allowed to improve your lie without penalty on certain parts of a golf course. It’s a local rule only and is also known as ‘winter rules’. It’s only in effect if you’re informed upon arrival at the golf course. ‘Preferred lies’ means a golfer can lift up the ball (if he or she want to) that is landed on a closely-mown area and move it to improve the ball position, but not closer to the hole. A closely-mown area is any area of the course that is cut to fairway height or less and includes paths cut through the rough and the fringe/apron around the green. 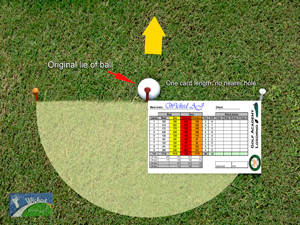 If the ball doesn’t lie on a closely-mown area, the player can’t take a preferred lie. Why does this (local) rule exist? Imagine a golf course is struck by a very bad drought. Its fairways are baked and there are bare patches of ground in the fairways. Than course management, a committee or the club might invoke the ‘Preferred Lies’ (local) rule so that its golfers can find a good lie in those damaged fairways. Only than a player is entitled to prefer the lie of their ball. Simply saying “preferred lies in operation” or “winter rules apply” is inadequate. Nor can a player decide himself that the rule is in effect. How to handle in the situation of a preferred lies? The position of the ball must be marked first. This can be done with a tee, a pitch fork or e.g. a coin. Than you can lift the ball up and clean it if desired. The ball must then be (re)placed on a spot not nearer to the hole within the area specified e.g. within six inches, a score card-length or perhaps even one club-length (which is for example common on the PGA tour). This distance is decided by the local commission. So it’s best to check it in advance, to avoid an unnecessary penalty of one stroke. An example of a terrible mistake in such as case you can read in the Funny Golf Facts. The ball is in play as soon as it’s placed on the ground. 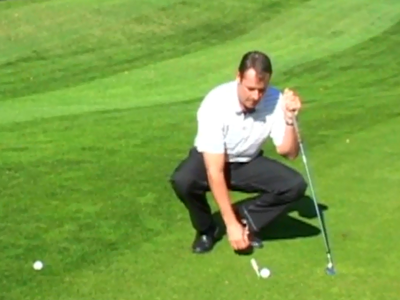 If the player picks it up again and moves it, he would incur a penalty stroke for ‘moving his ball in play’. Preferred Lies and other winter rules are no official Rules of Golf; instead, they are always a local rule.